‘Tis the season for boozy coffee drinks and desserts, so here’s a pie I made yesterday using Kahlua. I was lucky in that the Kahlua and all of the other ingredients were things I had on hand, however the pie was so good I wouldn’t hesitate to go out and buy all the ingredients again. The inspiration for this pie was one I saw in Southern Living, only it did not have the chocolate layer and it was 8 inches rather than 9. If you’ve ever had the old Hershey Bar Pie then you’ll recognize the technique of using melted marshmallows for thickness. You heat milk and marshmallows together in a double boiler or microwave, let cool, add flavorings, fold in whipped cream, and freeze. The result is a frozen pie that is not completely hard and icy, but rather firm and soft set yet not gelatinous. The gelatin in the marshmallows keeps the pie from freezing rock solid. Also, I’ve been meaning to share this tip about storing pie. 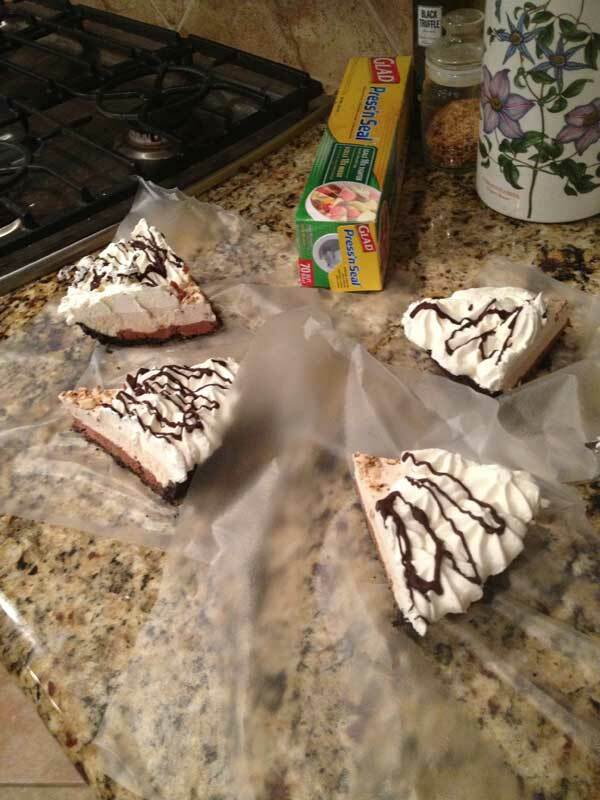 For those who live alone or have small families, you can store pie by cutting it into wedges, freezing, and wrapping individually in plastic wrap. I’ve been making a lot of pies lately, and this method saves us from being stuck with the same pie for a week. I’ll make a coconut cream and freeze all the wedges, then follow up with another flavor and freeze those wedges, and another. We do wind up with a freezer full of frozen pie wedges, but that’s not exactly a problem! Frozen pie keeps very well if you wrap it tightly. 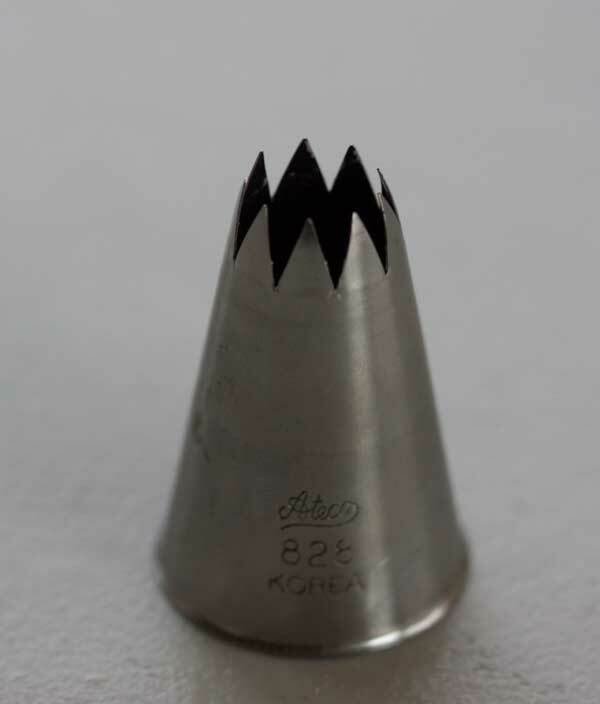 For good looking pies, treat yourself to an Ateco 828 tip. You can usually find them at cake decorating stores and you can always find them on-line. The large open star tips are great for topping cupcakes or piping out the perimeter of pies. I bought mine as part of a set and use it all the time. Here’s a link to the set I recommend: Ateco Large Tube Set. Mix the Oreos and butter and press into bottom and up sides of a 9 inch deep dish glass pie plate. Put the crust in the freezer. In the top of a double boiler, combine 24 of the marshmallows, ½ cup of the milk, and salt. Stir over simmering water until marshmallows are melted. Transfer to a mixing bowl. Alternatively, you can combine marshmallows, milk and salt in a microwave-safe mixing bowl and just heat, stirring every 15 to 30 seconds, until melted and smooth. Repeat procedure with 6 remaining marshmallows and 2 tablespoons of milk. When marshmallows have melted, immediately add 2 ounces of chocolate and stir until melted and smooth. Let both mixtures cool at room temperature for 1 hour. When mixtures are cool, stir the Kahlua into the larger (24 marshmallow) batch. Beat ONLY 1 1/3 cups of the cream until stiff peaks form. Fold about a quarter of the whipped cream into the chocolate mixture and spread across bottom of pie dish (it will be a pretty thin layer). Fold remaining whipped cream into the Kahlua mixture. Chill the Kahlua mixture for 30 minutes to thicken it somewhat, then pour it over the chocolate layer. It should come almost to the top of the pie dish. Put the whole pie in the freezer for about 8 hours. When pie is frozen, beat the remaining 1 cup of cream until peaks are stiff. Beat in powdered sugar and vanilla. Pipe around the edges of the pie. Put back in the freezer until ready to serve. You can garnish it however you want, but I melted 1 oz of chocolate and 1 teaspoon of oil in a heavy duty freezer bag in the microwave for 30 seconds, snipped off the tip, and squeezed chocolate mixture over the frozen whipped cream border. I sprinkled almonds in the middle. Let the pie sit out at room temperature for about 30 minutes before slicing -- a good trick is to set the frozen pie in a rimmed baking pan with hot water in it. This will help loosen the frozen crust from the pan. 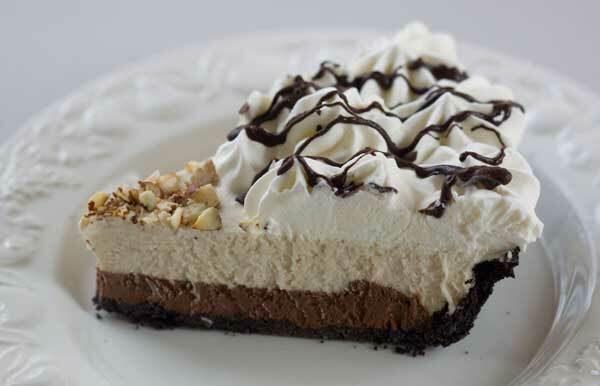 Hope you enjoy the Chocolate and Kahlua Cream Pie. The pie sounds delicious! Never thought to use a decorating tip on my pies. Going to try it!